Another interesting scale is that of mass. Clusters are the most massive objects in the universe (typical mass of clusters is ~ 10^14 solar masses and above). They spawn from initial dark matter density perturbations in the very early universe, grow by adding nearby perturbations, convert into stable structures, and then go on a mass-accreting spree for billions of years into the evolved structures – made up of a dark matter halo, hot plasma, old galaxies and chaos – that we see today. Naturally, being able to predict or detect what would be the most massive galaxy cluster ever is a challenging task, but fruitful nonetheless. Because of the finite volume of the universe that can be observed, there must be ‘an object’ (likely a galaxy cluster) that can be called the most massive. Fig 1. The El Gordo cluster. With a mass of 2 x 10^15 solar masses, at z = 0.87, this is one of the most massive objects in the universe. Hubble Telescope observations of galaxies seen here, overlaying X-ray emissions as observed with the Chandra Telescope. Theoretical studies in cosmology and growth of structure in the universe use a unique tool to answer such a question – the Halo Mass Function (HMF). An HMF essentially describes the distribution of dark matter halos in the universe above a given mass threshold, at a given redshift, per unit volume. This number and distribution is naturally intrinsically linked with early universe physics, and how the universe has evolved since. This ‘function’, depends on both mass and redshift, as can be seen in the figure. Fig 2. 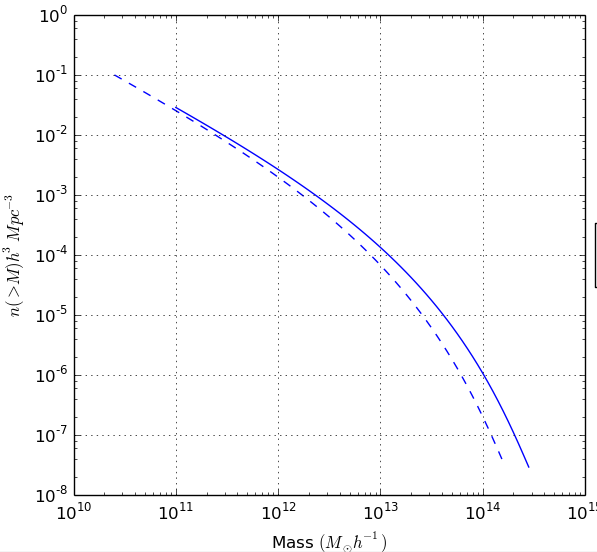 A modified form of the Halo Mass Function (HMF) – number of dark matter haloes to be observed above a mass threshold as a function of mass, at z = 1.2 (solid blue curve) and z = 1.6 (dotted blue curve). Figure credit : HMFCalc. Let’s use a realistic example to solidify our understanding of this analytical tool, using the SPT-SZ survey that studies the cosmic microwave background and galaxy clusters. Imagine a cube, with an area of 2500 square degrees (~50 degrees wide on each side) on the sky that the survey covers, and a depth between redshifts 1.2 and 1.6 (which is approximately 4 billion parsecs, or 13 billion light years long). A typical mass function – using the standard cosmology models of the universe – gives us approximately 10-20 dark matter haloes (corresponding to galaxy clusters) in this volume. Guess what? The SPT-SZ survey sees approximately 10 galaxy clusters in this mass range at that distance! Today’s paper – from 2010 – talks of the most massive galaxy clusters, which are rare in the universe. The HMF’s shape and amplitude agree with that – it has a tail end that tells us the chance of seeing extremely massive (and hence rare) objects e.g. dark matter haloes greater than 10^15 solar masses. The authors use this to generate distributions of halo masses, and determine what the most massive object could be within the regime of statistical uncertainties. These probabilistic analyses – based on the HMF for a Lambda-CDM cosmological model – claim that the most massive object could have a typical mass of 4 x 10^15 solar masses, sitting at a redshift of z =0.22 (3.6 billion light years away from us). Fig 3. Solid-colored contour plots showing the probability of the most massive objects potentially seen in different surveys, as they lie on a mass vs redshift graph. One can see that as the survey area decreases (from 11 sq. 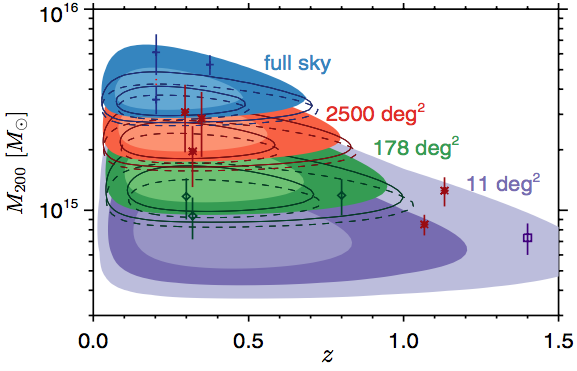 degrees to full sky of ~ 41000 sq degrees), our ability to say what and where the most object could be improves significantly, with the sizes of the contours depicting uncertainties in both mass and redshift. Credit: Figure 1, today’s paper. What do observations tell us? The authors claim that ‘the most massive object in the universe is likely to have already been detected’. Surveys like ROSAT (an all-sky survey) and SPT-SZ (1/8th of the entire sky) have several massive clusters. A potential candidate for this award though goes to Abell 2163 (z=0.2, a mass of 3.4 +- 0.8 x 10^15 solar masses). Several other candidates are also mentioned in the paper, as well as their likelihood of being the most massive cluster in the universe, according to the author’s analysis. Fig 4. 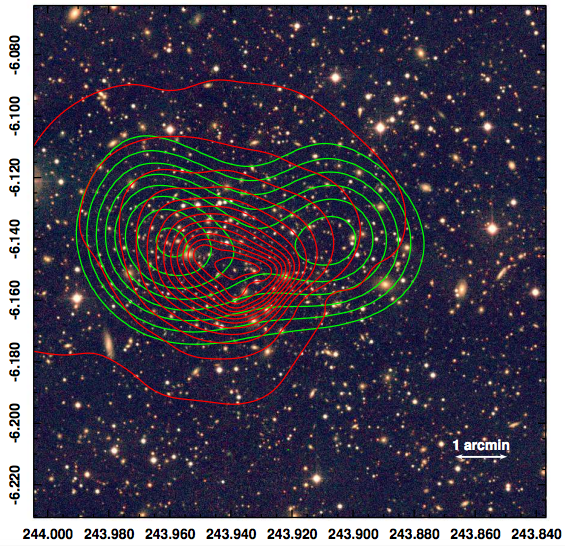 Abell 2163 image, with green contours depicting mass concentration in the galaxy cluster, and red contours depicting x-ray imaging. This may be the most massive galaxy cluster observed in the universe. Credit: Soucail et al 2017. Is the exact mass of the ‘most massive’ galaxy cluster actually interesting to cosmology and astrophysics? It could be. If an analysis like this paper predicts that the most massive cluster has a much lower or a much higher mass than we have observed, this could be an indication that the universe deviates from the standard Lambda-CDM model. It could also be an indication that our understanding of the HMF is skewed at higher redshifts, if we indeed end up discovering more massive objects in that regime than predicted. That being said, this should be taken with a pinch of salt, primarily because there are several caveats to our observations of galaxy clusters. HMFs are mostly created from simulations of the universe, not from observations. Moreover, comprehensive full-sky surveys do not exist yet. The limited-volume surveys that do, are ones that have selection effects e.g. they can’t observe clusters below a certain mass or luminosity threshold, which makes it easier to miss some unique galaxy clusters that might be massive but not luminous (or vice versa). Also, an interesting question to ask is whether putting a number on what the most massive object is could ever prevent the formation of a cluster that is an ‘outlier’ or just happened to form in a special region in the universe. These caveats will be overcome. 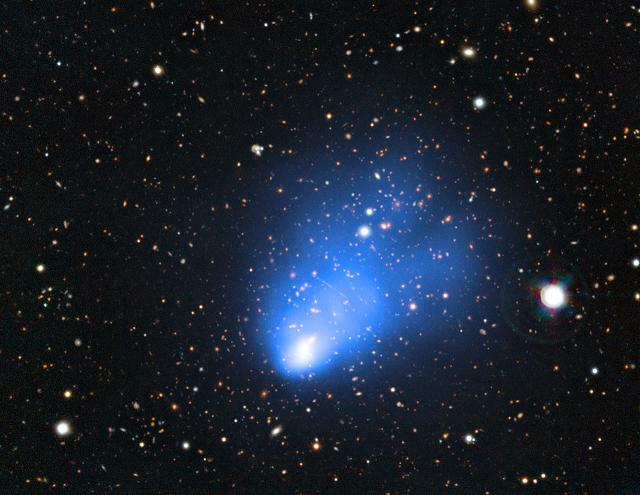 Large surveys like LSST and WFIRST in the next decade are to observe thousands of galaxy clusters, providing strong constraints to theoretical HMFs. Perhaps pinning down these extreme objects is not a bridge too far!